That’s what athletes from five Great Basin Conference schools gave Wednesday afternoon during the Bob Shay Invitational prep track and field meet on the Hailey oval. It’s hard to believe that 25 years have passed since Shay retired in 1988 after serving for 33 years as a Blaine County schoolteacher. And it’s hard to believe that 13 years have elapsed since Shay passed away in 2000 at the age of 73. His influence is still keenly felt. But Shay, who loved distance running, would have liked the distance output of the Wood River teams Wednesday during the girls’ and boys’ meets won in dominating fashion for a second straight year by the Canyon Ridge Riverhawks from Twin Falls. Wood River’s teams each finished third of the five schools—the Wolverine boys piling up 34 of their 83 points in the three distance runs, and the Hailey girls amassing 56 of their 102.3 points at distance. Senior Chase England won the 1600m by over nine seconds while junior Haley Montgomery earned 28 points with first places in the 3200m and 800m, and second in the 1600m. Other seconds in distances went to soph Kenya Schott 800m, soph Alexis Gonzalez 3200m and junior Mariah Stout in the 3200m. Meanwhile, Boise State University-bound senior Ian Keys raised the temperature on a sunny but cool afternoon with a pair of sprint wins. Stadium 100m dash record holder and Idaho’s fastest in the short sprint this spring, Keys won the 100m in 10.90 seconds and added the 200m victory, 22.70. Promising Wolverine freshman Sara Lichtenberg added the final of six Wood River gold medals at the Shay with a winning 5-4 high jump. Nicole Pratt, another of the six Wood River seniors honored on “Senior Day, placed second in the 300m intermediate hurdles and third in the 100m dash. Other seconds went to sophs Taylor Douthit (discus) and Kyle Mungal (400m). Otherwise, it was a Canyon Ridge kind of afternoon. Riverhawks senior Kayla Lee had 40 individual points and four of Canyon Ridge’s 11 girls’ gold medals with first places in the 100m, 200m, long jump in 17-5 and triple jump by four feet in 37-1. Canyon Ridge beat Twin Falls by 65 points. Senior Bobby Rios of Canyon Ridge accounted for 25 individual points with second places in the 100m and 200m, plus key roles in the winning 4x100m and 4x200m relays. The Riverhawks boys (7 golds) swept the four relay races to out-point Twin Falls by 55. Next up: The state-qualifying Great Basin Conference 4th District 4A meet Wednesday and Thursday, May 8-9 at 1:30 p.m. at Canyon Ridge. 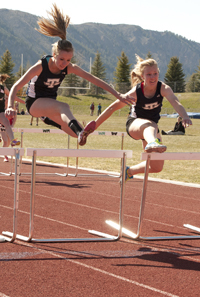 Teams: 1—Canyon Ridge of Twin Falls 196 points (44 sprints, 6 distances, 18 hurdles, 40 relays, 88 field). 2—Twin Falls 141. 3—Wood River 83 (30 sprints, 34 distances, 0 hurdles, 4 relays, 15 field). 4—Burley 77. 5—Minico of Rupert 31. 100m: 1—Ian Keys (WR) 10.90 seconds. 200m: 1—Ian Keys (WR) 22.70. 6—Kyle Mungal (WR) 24.70. 400m: 1—Beau Dunford (Canyon Ridge) 55.10. 2—Kyle Mungal (WR) 55.30. 6—Cameron Bingham (WR) 57.10. 800m: 1—Jeremy Stark (Twin Falls) 2:06.20. 3—Alexis Gonzalez (WR) 2:09.90. 4—Chase England (WR) 2:11.20. 1600m: 1—Chase England (WR) 4:36.20. 3—Alexis Gonzalez (WR) 4:59.10. 3200m: 1—Ethan Judd (Burley) 10:44.70. 2—Alexis Gonzalez (WR) 11:14.10. 4x100m relay: 1—Canyon Ridge (Scott Warner, Bobby Rios, Keegan Barton, Jake Packham) 44.30. 4x200m relay: 1—Canyon Ridge (Jake Packham, Scott Warner, Bobby Rios, Sead Muradbegovic) 1:33.10. 4—Wood River (Ian Keys, Kyle Mungal, Torrin MkKenzie, Brandon Yagla) 1:38.50. 4x400m relay: 1—Canyon Ridge (Jake Packham, Eric Navarette, Sead Muradbegovic, Beau Dunford) 3:41.50. Sprint medley relay (200, 200, 400, 800): 1—Canyon Ridge (Chandler Colver, Chris Rainville, Vincent Burk, Eric Navarette) 3:59.80. Shotput: 1—Keegan Luker (Twin Falls) 42-4.25. Discus: 1—Keegan Luker (Twin Falls) 125-01. 2—Taylor Douthit (WR) 120-01. Pole vault: 1—Powell Gibson (Minico) 10-6. 6—Cameron Bingham (WR) 9-0. High jump: 1—Karsten Hinckley (Burley) 6-0. Long jump: 1—Scott Warner (Canyon Ridge) 20-0.5.3—Josh King (WR) 18-2.75. Triple jump: 1—Kerim Muftic (Canyon Ridge) 39-11. Teams: 1—Canyon Ridge 218.5 points points (41 sprints, 14 distances, 21.5 hurdles, 36 relays, 106 field). 2—Twin Falls 153.66. 3—Wood River 102.33 (5.33 sprints, 56 distances, 14 hurdles, 12 relays, 15 field). 4—Minico 22.5. 6—Burley 11. 100m: 1—Kayla Lee (Canyon Ridge) 13.30. 3 (tie)—Nicole Pratt (WR) 14.00. 6 (tie)—Lexi Browne (WR) 14.20. 200m: 1—Kayla Lee (Canyon Ridge) 27.20. 400m: 1—Jullia Aguayo (Canyon Ridge) 1:02.00. 800m: 1—Haley Montgomery (WR) 2:31.20. 2—Kenya Schott (WR) 2:36.00. 5—Mariah Stout (WR) 2:46.50. 1600m: 1—Alyssa Brann (Twi Falls) 5:38.40. 2—Haley Montgomery (WR) 5:40.80. 3—Janel Passey (WR) 5:47.80. 4—Mariah Stout (WR) 6:13.00. 3200m: 1—Haley Montgomery (WR) 13:14.50. 2—Mariah Stout (WR) 13:57.20. 100m high hurdles: 1—Meghan Jones (Twin Falls) 17.00. 3—Emilia Bingham (WR) 18.70. 300m intermediate hurdles: 1—Ellie Packham (Canyon Ridge) 50.00.2—Nicole Pratt (WR) 50.10. 4x100m relay: 1—Canyon Ridge (Rebecca Cabello, Marney Tripp, Ellie Packham, Victoria Jones) 52.00. 3—Wood River (Emilia Bingham, Brooke Sundholm, Lexi Browne, Chloe Lichtenberg) 57.50. 4x200m: 1—Twin Falls 1:49.40. 4x400m: 1—Twin Falls 4:23.00. Sprint medley relay (100, 100, 200, 400): 1—Canyon Ridge (Jenna Adkins, Victoria Jones, Rebecca Cabello, Jullia Aguayo) 1:58.00. 3—Wood River (Emilia Bingham, Brooke Sundholm, Lexi Browne, Kenya Schott) 2:08.00. Shotput: 1—Caitlyn Joslin (Canyon Ridge) 30-4.25. Discus: 1—Taylor Stanger (Canyon Ridge) 98-1. Pole vault: 1—Marney Tripp (Canyon Ridge) 8-0. High jump: 1—Sara Lichtenberg (WR) 5-4. 3 (tie)—Chloe Lichtenberg (WR) 4-4. Long jump: 1—Kayla Lee (Canyon Ridge) 17-5. Triple jump: 1—Kayla Lee (Canyon Ridge) 37-1.